Increase Speed to Market, Digitally Modernize & Enhance Security for your organization. Designing, developing and deploying applications in the cloud is on the critical path to digital transformation and modernization. Businesses of all sizes benefit from increased agility, speed to market, reliability, and enhanced security. Whether you are just starting out or a business born in the cloud, Tallan can help you build, grow, and optimize your business using the cloud. Build your most intelligent applications on Azure. Improve Productivity, Encourage Collaboration, and Embrace the Security. Office 365 is the anywhere, anytime, easy to use platform that you want with the speed and security that you demand. Monitor, Track, Analyze, and Utilize data in real time. Azure IoT Suite is connecting devices, people, and systems all over the internet. Data capture and real time monitoring that used to be cost prohibitive can now be cost effective with an Azure IoT solution. Start small, succeed and scale fast. Reduce Costs, Minimize Downtime, Preserve your Reputation and Insure Compliance with Industry Regulations. Azure DRaaS provides an easy to deploy, easy to maintain, secure solution when you’re looking to reduce infrastructure costs and/or minimize downtime during a disaster. At Tallan we have a passion for technology and helping our clients solve their business problems. 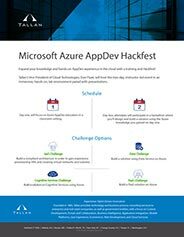 Our Azure AppDev Hackfests are held nationwide every year and are a great way for teams from your organization to get hands on exposure to Azure and learn best practices in developing and modernizing applications in the cloud. These two day events are led by our Vice President of Cloud Technologies, Dan Fluet along with other experts from Tallan to educate and guide you. Let Microsoft and Tallan begin your move to the cloud with an in house Azure Dev Workshop. 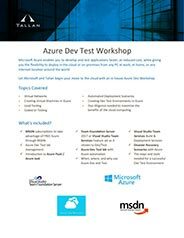 During the workshop, we will describe topics such as Virtual Networks, Creating Virtual Machines in Azure, Load Testing, Coded UI tests, automated deployment scenarios, what it takes to create development and test environments on Microsoft Azure, and the careful planning and due diligence needed to maximize the benefits of cloud computing. 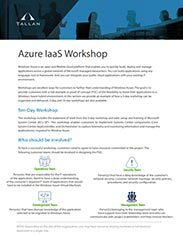 The Azure IaaS 10-day workshop is designed to help you understand what Azure Iaas can provide your organization. Through this workshop you will experience the security and flexibility of the cloud designing and learn about developing and deploying applications in the cloud, which has become an essential modernization for many organizations. Microsoft Azure is an open and flexible cloud platform that enables you to quickly build, deploy and manage applications across a global network of Microsoft-managed datacenters. You can build applications using any language, tool or framework, and you can integrate your public cloud applications with your existing IT environment. Active directory health depends on technical, organizational and process factors. 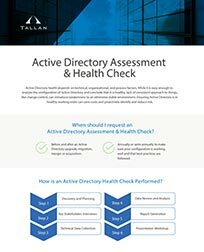 Most organizations utilize Tallan to create a consistent approach to keeping their Active Directory healthy and up to date. This ultimately results in healthy environments that drive efficiency and long term cost savings through annual checkups. With growth in mind, AFR needed a more intuitive and user-friendly interface to deliver their unique loan programs and services to partners nationwide. 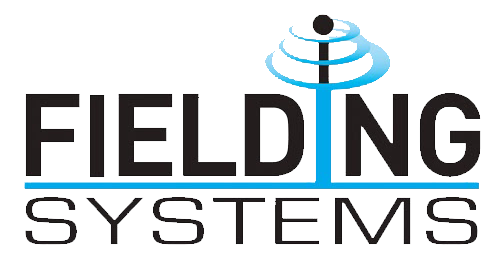 This Business Communications Standards Organization utilized a hackfest training to create cloud-based web applications and an enterprise cloud environment. How Well Am I Utilizing the Cloud? With the information you provide in this survey, our team of Cloud Technologists will calculate your answers depending on the activities you conduct in the cloud, monthly spend, plans to migrate additional workloads, etc., provide you with a customized review of your current cloud utilization. 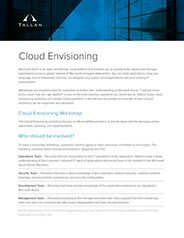 This information can help your organization better plan your cloud roadmap and collaborate with our cloud team to make it happen. Check Out Our Blog for News and Updates! Tallan's top technologists share their thoughts on the latest web and mobile technology challenges, opportunities, and platforms. Learn more about how our adaptive cloud solutions can enhance your business operations and save you money today!